In the UK, however, Heather gets the same sort of air-time and intense media scrutiny as, say, Britney, and for similar reasons: their lives are high-wire acts that could come careening down — in a tragic yet altogether riveting manner — at any moment. But now she’s done it. During another typically bizarre day for Heather Mills, the former model yesterday urged people to try drinking milk from rats and dogs to help save the planet. But reindeer milk! 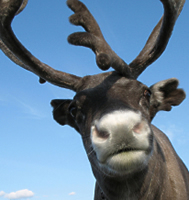 Weighing in at a whopping 22% milk fat, reindeer milk is pretty much a brevé on the hoof! Consider that for your Christmas cappuccino!